The artificial fog fountain, also called mist fountain, can built a borderland between reality and dreamland. It can be used independently in amusement parks, stages, etc. Also, it can be used in conjunction with musical fountain and program controlling fountain. This kind of fountain is made in the way that normal water passes though the aerosol nozzles under high pressure. And it can soften the scenery. Its artificial fog can only create a magical humanity landscape for different places, like theme parks, gardens, ponds, water, bridges, sculptures, etc. 1.It can generate natural negative ions to purify and clean your surroundings. And the moisture air made it is very beneficial for individuals suffering from allergy, cold, bronchitis, or asthma. 2.Remote controller, multiple color changing led lights, fogger and transformer are available in the collection of our mist fountain. 3.The artificial fog fountain is helpful in preventing skin irritations and dandruff by the means of moistening air. 4.Through adding negative ions into the indoor air, it can prevent nasal congestion and allergy symptoms for people. 5.By transforming water into enchanting mist, it can help to reduce the endorphin levels in the brain. As a professional manufacturer of artificial fog fountain in China, Guangzhou Water Art Fountain Irrigation Garden Co., Ltd also provide many other water fountains, water features and fountain nozzles for clients around the world, including music fountain, programmed animated fountain, garden fountain, square fountain, scenic fountain, sculpture fountain, wall fountain, waterfall feature, digital water curtain, creek water feature, indoor water fountain, direct jet nozzle, central upright fountain jet, morning glory nozzle, flower fountain jet, rotary nozzle, flat nozzle, fan nozzle, adjustable nozzle, water sphere and hemisphere nozzle, etc. For all of our products, lifelong maintenance is available. We have built up lifelong cooperative relationship with customers from Malaysia, Brunei, Tajikistan, Saudi Arabia, UAE (United Arab Emirates), and many other countries in Central Asia and Southeast Asia. 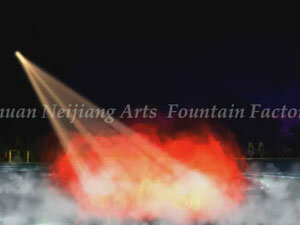 If you need our artificial fog fountain, please do not hesitate to contact us. Waterfall RockeryThe waterfall rockery functions as decoration both indoors and outdoors. And it is easy and simple to ship and install.